go. As we ripped out the drooping vines, I noticed dozens of green tomatoes. The voice of my mother – the person who saved, flattened out and reused aluminum foil – jumped into my head. “It seems a shame to waste all these tomatoes,” it said through my mouth. We didn’t think that the Inter-Faith Food Shuttle, where most of the garden’s produce goes as part of the Plant a Row for the Hungry program, would want green tomatoes. In a fit of optimism, I took them. Even after becoming picky and only selecting the largest ones, I could barely drag my bulging bag the two blocks back to my house. There must have been at least 20 pounds of hard, green balls in there. The green tomatoes led me to violate one of the cardinal rules of entertaining: Never serve to guests a recipe that you’re making for the first time. But I was surrounded by green things, and these were old and tolerant friends who would eat almost anything that wasn’t once hoofed or feathered. I found a green tomato pasta sauce recipe in “Tomatoes: A Savor the South Cookbook” by my friend Miriam Rubin. It was simple – garlic, parsley, some hot peppers and the tomatoes – and I added crabmeat. It was a success (although linguini might have been a better pasta choice than rigatoni). But if it was followed by The Hub’s chocolate cake, even shredded paper would’ve been proclaimed gourmet, so I had dessert as back-up. 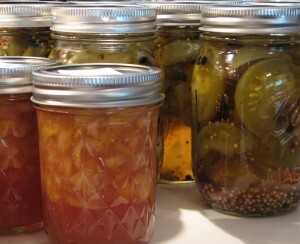 Then I wanted to make green tomato pickles. I had never made them, and had eaten them only once. I purchased a jar for the Thanksgiving relish tray many years ago, and remembered their interesting flavor and texture. I combed through canning books and cobbled the recipe at the end together from several ideas. Easy? Yes. But it will be another week or so before I can say how they taste, because all pickles must sit for a period of time to, well, pickle. Last night, it was the classic fried green tomatoes with our Labor Day grilled burgers. In a large saucepan, combine the vinegar, red pepper, mustard seed, sugar, peppercorns and celery seed. Bring to a boil, stirring occasionally. When the sugar is dissolved and the mixture is boiling, remove from the heat. Have clean, sanitized pint jars, lids and rims ready. Drop 1 clove garlic into each jar, then pack in the tomatoes. Pour the vinegar mixture over the tomatoes, leaving 1/2-inch headspace. Push a wooden skewer gently into the mixture and around the sides to release any air bubbles. Wipe the rims and screw on the lids and rims. Process the jars in a boiling-water canner for 15 minutes. Remove the jars from the canner and cool on folded towels or racks. Ten years of Tomatopalooza – wow. And it all started in a geeky guy’s driveway. The difference today is that Craig LeHoullier is now a full-time tomato-guy, after leaving his chemist job at Glaxo, His interest in collecting and promoting heirloom tomato varieties grew into a passion for preserving and perpetuating these unusual, flavorful tomatoes. He started collecting seeds and growing plants, which he sells at farmers markets. Slow Food USA has recognized LeHoullier for rediscovering and preserving the Cherokee Purple, which the organization has named to its U.S. Ark of Taste. 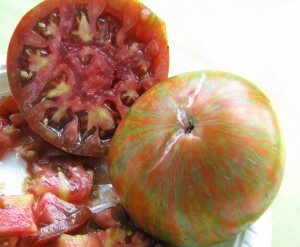 Cherokee Purple is one of the most popular and more widely available heirlooms, with rich, balanced flavor (not too acid, not too sweet) and meaty texture. 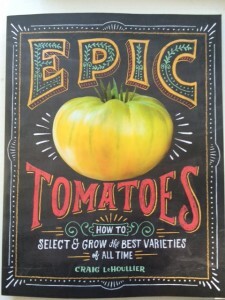 Tomatopalooza started as a way to popularize heirlooms among tomato-growing nuts. 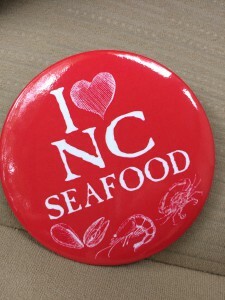 This year, as always, visitors were asked to vote on their favorites. I never do – because I’d take any of them home (although I do prefer a more acid-tasting tomato; love that tartness). Black, green, yellow, white, crimson, even one with a green-and-red tie-dye look. Sweet, acid, bright, smoky flavors. Tiny ruby ‘maters the size of the tip of my little finger (Mexico Midget). Giant Cherokee Purples like softballs. More than 160 varieties in all were on the long tables beneath the welcome shade of trees on an Efland, N.C. farm last Saturday. I tasted the same variety, called Carbon, provided by two different growers and they didn’t taste exactly the same, like wine produced in different terroirs. Actually, there are many similarities between great tomatoes and fine wine, and both stain your shirt if you’re clumsy. By the way, despite what many people think, there is really no such thing as a low-acid tomato. All tomatoes have about the same acid content, and differences in flavor are caused by variations in the sugar-to-acid ratio. That means that sweeter-tasting tomatoes have more sugar, not less acid. LeHoullier also offered samples of what he calls the “dwarf project”: His work with an Australian scientist to tame the heirloom plants, which can grow 8 to 10 feet tall, into four or five-foot home versions that might even work in containers. To find out more about LeHoullier and his projects (he also hosts tomato dinners are area restaurants and is working on a book) visit here. And you can see more delectable photos here. A white tent popped up this summer in the parking lot of the Party Beverage store at Powell Drive and Western Boulevard near my house. The first few times I flew by it on Western, I figured it was some kind of beer keg annex, until I saw that it had plants. It’s actually a little curb market, like the ones that sprang up on the sides of the road when I was a kid in Winston-Salem, N.C. When I stopped to look around, it was obvious that some of the items were not local (limes, for example). I asked the quiet teen who was manning the stand where the produce came from. He quickly pointed out what was not from North Carolina, and said his grandfather grew most of the rest. I couldn’t get a lot more out of him as he went to help another customer. The honey was from Mocksville, N.C., and there were corn, cukes, melons and herb plants. I went right for the tomatoes. Wherever the rest of the vegetables and fruits came from, these tomatoes were obviously farm grown, and from not too far away because they were a tumble of tender-skinned heirlooms in pink, red, maroon and bi-colors. Red and yellow cherry tomatoes were displayed like jewels in china bowls. I bought an assortment of the large tomatoes. They were the best, along with the CSA’s, that I’ve eaten this summer. And now I’ve ruined it for myself because y’all will drive straight over there for these mystery ‘maters. But I’m closer. I’ll be there first. I had a big food weekend, and it’s taken until now to recover and tell y’all about it. On Saturday, I assisted with registration at Tomatopalooza, which drew more than 100 people in a drizzle at Apex Community Park. 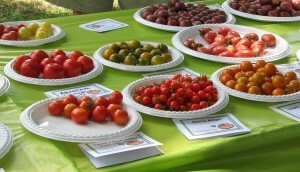 This annual festival of heirloom tomatoes is organized by Craig LeHoullier and Lee Newman. Craig sells heirloom tomato plants and has been involved in locating, saving and growing rare heirlooms for many years. Read more about them here. 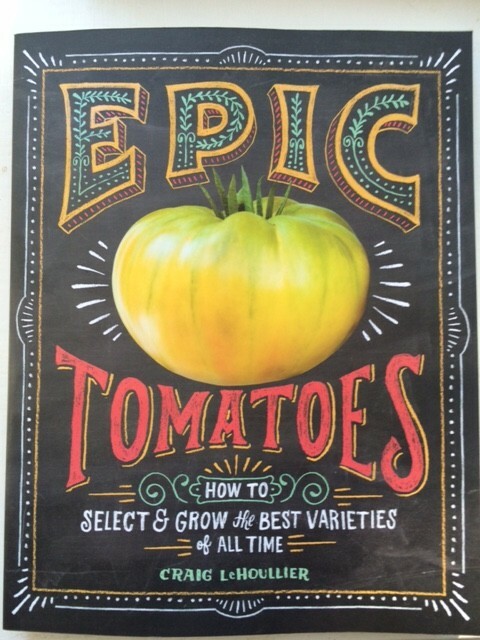 I have attended for several years but felt obliged to help this time, since the article I wrote on the event for Our State magazine might have led to a flood of tomato fans. 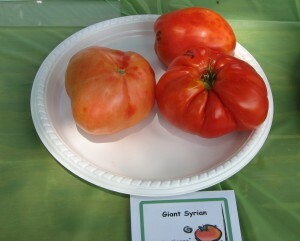 There were more than 160 varieties of tomatoes, ranging from pearl-sized Mexico Midgets to a Georgia Streak weighing in at 1.8 pounds (that’s for ONE tomato). 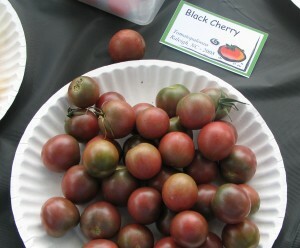 Black Cherry won the popular vote for best tasting. The medium-sized, purple-and-green tomato is a perennial favorite, and I like its balanced flavor. It’s too small for a BLT, though. You need a big slab of tomato, preferably one with enough acid flavor to balance the richness of the bacon (in my opinion). It’s still hard to beat Brandywine or Cherokee Purple for a good BLT. I discovered that a big advantage of helping is getting to take home the leftovers, so I have been throwing a wide range of tomatoes into dishes ever since. That night, the hub and I attended a birthday party. I will disclose neither the location nor honoree, because the hosts were serving smuggled pork product. They had visited Spain recently, and returned with a hunk of rare Iberian jamon, which they sliced with a generous hand. I’ve never seen this stuff around here. It’s like prosciutto, except deeper and richer, a little more fat and less salty flavor. It comes from a special breed of pig found only in Spain (our host said Spain won’t even let the DNA out of the country) and fed on acorns. I wondered how they got it back here – I’ve seen customs take food away from nuns, for goodness sake. The fresh-faced, young couple convinced customs that they were late for their connection, so the officers didn’t open the luggage. There they would have found a bouncing baby jamon wrapped in clothing. With fresh figs from their yard – ham heaven. But I realized that you’re really getting old when you’re more excited about ham than the joint that was passed around.